In our most recent monthly Harbour Outlook we set out our core view. Markets have experienced goldilocks conditions over the past 5 years, with solid economic growth, low inflation and low interest rates. Through 2018 we have seen growing signs of a transition from this backdrop. In New Zealand, for example, growth appears to be moderating as capacity constraints bite in some sectors, while wages and cost pressures are emerging from a very low base. After being spoilt by a period of unusually low volatility for many years, markets have become choppier in 2018. Looking forward, we expect this to continue into 2019, as market volatility reverts to more normal levels. To be clear, with global inflation still relatively subdued, we see global and domestic interest rates remaining reasonably low for some time, with central banks not in a hurry to remove stimulus. In our view, that is an environment that is still quite supportive for asset markets. However, with economies and sectors potentially experiencing different phases of the economic cycle, and valuations in some markets elevated, we believe we are moving away from a time when the value of all markets and securities rise on the same tide. In our view, market themes like technological disruption will also create a situation where there are more winners and losers, generating more dispersion in returns for active investors to identify. This core assessment primarily drives our positioning in active portfolios. So, what risks might challenge our constructive view of markets in the year ahead? 1. 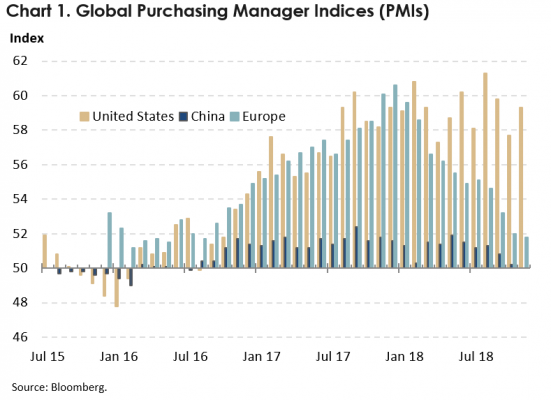 Global recession: It is hard to find signs of an imminent US recession in the most recent macroeconomic data, with Purchasing Manager Indices (PMI) still far into expansionary territory and the labour market still near full employment. However, the momentum of economic activity in Europe and Asia has disappointed, and there are worries that the US may also moderate into 2019 as monetary and fiscal stimulus wanes. Markets have focused on the US yield curve as a leading indicator of a recession that is flashing amber. In the past, an inversion of the yield curve (10-year yields below 3-month rates) has been a fairly reliable forbearer of an economic contraction. However, while the US yield curve has come closer to inverting in 2018, it is still upward sloping. Furthermore, in the past, it has typically taken 18 months to 2 years between the inversion of the yield curve and a recession. It is also crucially important to understand why the yield curve is moving, and the reason this usually results in a recession. Which brings us to the next risk to watch. 2. Central banks tightening policy faster than expected: This was one of our top risks last year, and the US Fed sticking to its hiking cycle was one issue that did rattle markets at times during 2018. In other parts of the world, as economic momentum moderated, and inflation remained subdued, the risk of the ECB or BoJ removing stimulus faster than expected did not eventuate. After lifting the US Fed Funds Rate steadily through 2018, the US Fed has changed their tone into the end of the year. They have flagged a more cautious, data-dependent approach ahead as the US Fed Funds Rate moves closer to their estimates of neutral that range from 2.5% to 3.5%. With this as the case, a key risk to markets would be an unexpectedly strong rise in core inflation which removes the ability for the US Fed to withdraw stimulus in a way that is market-friendly. That is a scenario where the US Fed is forced to aggressively tighten policy to head off an inflation problem. This is the environment where the yield curve would invert, as short-term interest rates would rise with the Fed Funds Rate, while long-term interest rates would fall as the market begins to price-in the ensuing economic slowdown. We do not believe this is an imminent risk, but it is one to watch closely. 3. Trade wars: There is typically a laundry list of geopolitical risks that markets worry about at any one time and then potentially forget and move on to the next. In 2018, US-China relations have risen to the top of this list and look set to linger for some time yet. Markets breathed a sigh of relief following the G20 summit when the US decided to delay the imposition of increased tariffs on Chinese goods. However, this has been short-lived given the scant amount of detail on any temporary agreement and lack of consistent tone in comments made by US and Chinese officials. Since the start of his presidency, Trump has followed the same geopolitical playbook: creating a sense of crisis in diplomatic relations; making unreasonable demands; setting an arbitrary deadline for action or retribution; making friends at the last minute; and then announcing a “great deal” to much fanfare that is not much different from the starting point. Our expectation is that the US and China will ultimately come to a resolution in a way that avoids a full-blown trade war. However, there is a risk that China plays a long game that disrupts Trump’s short-term game plan. There is also a general risk that an accident occurs along the way that results in an escalation of tensions more than both parties had ever wanted. 4. Domestic economic slowdown: Coming closer to home, while NZ GDP growth has remained robust at around 3% through 2018, very weak business confidence has lingered much longer than expected, creating the spectre of an impending slowdown in macroeconomic demand. However, at this stage, the evidence points more to growth moderating due to supply-side issues, as capacity constraints bite in some sectors. This is seen through both the difficulty to find skilled and unskilled labour, and firms feeling margin pressure as they struggle to pass on higher costs. There is a risk that these capacity pressures intensify in 2019, especially if there was a marked slowdown in net migration reducing population growth, or a shift in government policies away from building infrastructure. That could result in an uncomfortable combination of slower growth and higher inflation. 5. Australasian housing market correction: The Australian economy has been a quiet over-achiever in 2018, buoyed by low interest rates, strong terms of trade, the highest business confidence since the GFC, a pick-up in public sector infrastructure spending, and consumers that seemed to have become de-sensitised to political change. However, a risk looming over the Australian economy is the tightening in credit conditions connected to the Royal Commission on the financial sector, and the ensuing slowdown in the housing market that has seen house prices in Sydney and Melbourne down notably. So far, the deterioration in house prices has not materially impacted consumption – and there is an argument that given consumption was subdued on the way up, that it is unlikely to collapse as the air comes back out of the housing market. However, there could be a tipping point where consumers become much more cautious and that spills into a slowdown across the rest of the economy. Australia also has to contend with the uncertainty of a Federal election in 2019. 6. Credit crunch: There have been pockets of strains in global credit markets in 2018. As discussed above, Australian credit conditions have tightened somewhat, especially for new home loans. Credit spreads in global high yield bond and leveraged loan markets have also widened in 2018. This has both mirrored the rise in equity market volatility and reflected strains in particular areas such as the energy sector after the sharp fall in oil prices. By contrast, other evidence, such as the US Federal Reserve’s Senior Loan Officer Survey, suggests that credit conditions are still easy. If the global economy slows sharply and equity market volatility rises materially in 2019, there is a risk that this results in a more widespread credit crunch for corporates (and possibly sovereigns) that are reliant on leverage. The New Zealand corporate bond market tends to be somewhat sleepy and insulated, but would eventually be caught up in the wash, especially when issuers were required to access the market for new funding. 7. Hard landing in the Chinese economy: Much like inflation risks, this is something that everyone has been talking about for years now but has not materialised. New Zealand is exposed directly through our exports of dairy and tourism, and indirectly through Australia’s exposure to hard commodity exports. Our core view continues to be that the Chinese economy will navigate a managed moderation in growth and re-orientate over the medium-to-long-term towards being a more consumer-orientated, environmentally-focused, middle-class society. However, there is a short-to-medium-term risk of a hard landing and contagion to neighbours. High levels of leverage in the state-owned enterprise (SOE) sector remains a vulnerability. With regular analyst research trips to China, we will continue to monitor the short-term risks around our view. 8. US Presidential Impeachment: The Mueller Investigation into Russian interference in the 2016 US Presidential Election appears to be drawing to a close. As many of Trump’s allies and former staff plead guilty to offences, there is a risk that Trump comes closer to being impeached. Impeachment is a political process, rather than a legal process. History shows that US politicians have only initiated impeachment proceedings when the popularity of the President has fallen below a threshold, and members of his own party weigh up the chances of their own political survival. Now that the mid-term elections have passed, this removes one obstacle to Republicans that did not want the distraction of an impeachment during the build-up to an election. Even if this risk of impeachment were to materialise, the reaction of markets may vary through time. For example, short-term volatility driven by general uncertainty may be replaced by a sense of relief if markets believed that Vice President Mike Pence was a more stable, market-friendly President. 9. Brexit: There is no doubt that Brexit is a crisis for the United Kingdom, with uncertainty hanging over British businesses and political chaos a constant distraction for a large part of the British civil service. However, at the moment, it remains largely a UK-specific issue, with the British Pound acting as a shock absorber for the UK economy and barometer of progress in Brexit negotiations. For Brexit to have wider implications for financial markets, it may have to turn into a broader issue about the stability of the entire European Union. At the moment, the collective countries of the EU are showing far more solidarity than the UK can manage within one country. The other risk is that an adverse Brexit development combined with other risks to global markets to trigger a wider flight to safety. 10. Other (the ‘known unknowns’ and ‘unknown unknowns’): Often the risks that hurt markets are the ones that have fallen off the radar or been navigated easily in more recent times. For example, tensions in the Middle East could return to the fore in 2019, with plenty of underlying issues in Israel, Saudi Arabia or Iran that could arise; more friendly relations between the US and North Korea could sour; or fiscal pressures in Italy could finally spill over into broader problems in the Italian banking sector or European economy. With all these types of headlines that can come and go, the key questions are whether they are material enough to result in a widespread macroeconomic slowdown across a large region; pose a threat to the resilience of a banking system; or significant enough to cause a widespread rise in risk aversion across global financial markets. It is important to remember that risk is not always asymmetric and tilted to the downside. There are some upside risks to our core view in 2019. In the global economy, inflation pressures may remain dormant for yet another year, keeping central banks largely on the side-lines, with monetary policy accommodation supporting markets yet again. If lower oil prices persist, cheaper petrol prices may leave more money in the back pockets of consumers to lift discretionary spending. More generally, technological advances may see some companies grow their margins and the earnings of some sectors could exceed expectations. Domestically, business confidence may finally recover, prompting firms to take advantage of low interest rates and the scarcity of labour to embark on a wave of capital investment that boosts the economy. These also need to make up the possible scenarios that investors contemplate, when looking ahead to 2019.